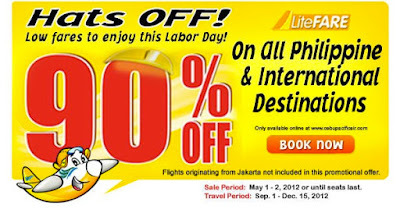 The Philippines’ largest national flag carrier, Cebu Pacific (PSE:CEB) lowers airfare up to 63% in a select international seat sale from May 3 to 6, 2012 or until seats last. 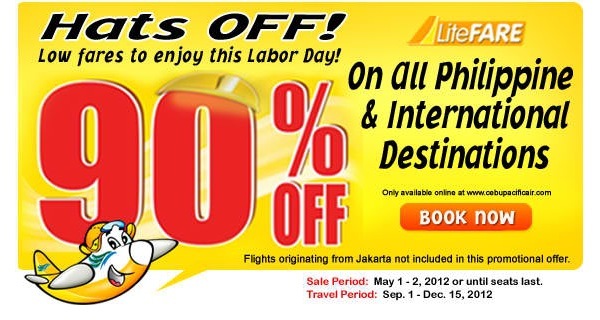 This is for travel from July 1 to September 30, 2012. Passengers can book P688 seats from Kalibo or Cebu to Hong Kong, or from Clark to Bangkok, Macau or Hong Kong. P888 seats are also available from Manila to Kota Kinabalu. Cebu Pacific is the only airline flying direct to Kota Kinabalu from Manila. P1,088 seats are also available from Manila to Brunei or Kuala Lumpur, as well as from Clark or Cebu to Singapore. Manila-Jakarta P1,488 seat sale fares are up to 63% lower than the lowest year-round Lite Fare of P3,999. “CEB continues to offer the lowest fare to allow even more Juans to travel. Travelers can plan their family vacations with maximum travel savings. These savings can translate to more budget for shopping or tours for an even more fun vacation,” said CEB VP for Marketing and Distribution Candice Iyog. Meanwhile, for travel from June 15 to August 31, 2012, passengers can take advantage of a select domestic seat sale as low as P288. Those headed for select Visayas destinations can buy P288 fares. This is available for those coming from Manila to Bacolod, Cebu, Dumaguete, Iloilo, Roxas, Tacloban and Tagbilaran. CEB also offers a P488 Mindanao seat sale for those going from Manila to Butuan, Cagayan de Oro, Cotabato, Davao, Dipolog, General Santos, Ozamiz, Pagadian, Surigao or Zamboanga. Lite Fares are inclusive of 7 kilos hand-carry baggage allowance but exclusive of check-in baggage, government taxes, fees and fuel surcharges ranging from P250-P500 for domestic routes and $15-$50 for international routes. how can i boook my ticket?